It’s a common belief that people and their dogs can look-a-like. Using that idea as a launchpad, Pedigree has launched a human-to-canine matching site named Doggelganger to promote the Pedigree Adoption Drive. 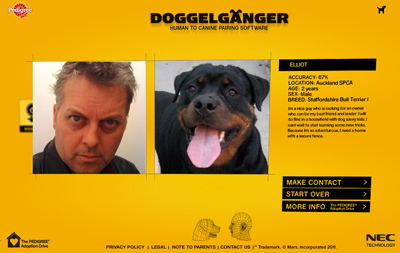 The website, created by Auckland agency Colenso BBDO lets users upload a picture of themselves and then tries to match them with their doggie double. Just check out my canine match, a handsome looking 2 year-old male Staffordshire Bull Terrier.